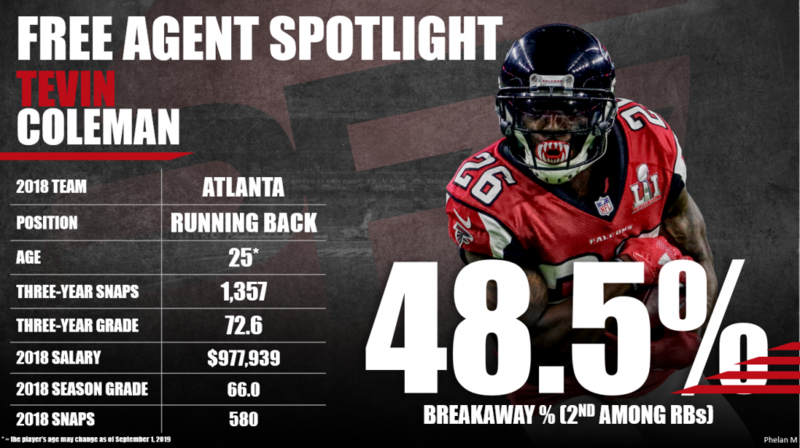 After a strong 2016 season, Atlanta Falcons’ Tevin Coleman has dropped in overall grade every subsequent year down to 66.0 in 2018. He offers value in the passing game in bursts but rarely has any level of game-to-game consistency both as a pass-catcher and runner. Coleman offers value as a complementary piece in an offense’s backfield, but he shouldn’t get treated like a feature back nor should he get paid like one. Subscribe to Pro Football Focus’ ELITE subscription to research Tevin Coleman’s grades, advanced stats, snaps and more in Premium Stats 2.0.